1Department of Biotechnology, A.S.B.A.S.J.S.M. College, Bela Rupnagar, Punajb, INDIA, Research scholar of IK Gujral Punjab Technical University, Kapurthala, Punjab, INDIA. 3Institute of Cellular and Molecular Botany, University of Bonn, Bonn, GERMANY. 4Department of Biotechnology, SUS College of Engineering and Technology, Tangori, Mohali, Punjab, INDIA. 5Department of Botany, Panjab University, Chandigarh, INDIA. Background: Crepidium acuminatum (D. Don) Szlach (family Orchidaceae) is an ethnomedicinal plant. It is used in breathing disorders, burning sensation, Cough, decrease in bone tissue, blood disorders, tuberculosis, as refrigerant, aphrodisiac, in insect bites, rheumatism, as tonic and in general debility. It is vital component of Ayurvedic formulation “Astavarga” with trade name “Jeevak means vitality of life. Despite the common utilization of this plant, no conclusive study has been reported so far regarding the pharmacognostic evaluation and antimicrobial activity. Aim: The present study was carried to evaluate pharmacognostic evaluation and the potential of C. acuminatum as antimicrobial. Materials and Methods: Organoleptic, histochemical, microscopic, physicochemical, extractive yield were studied to standardise pharmacognostic characters and well diffusion method were carried out for antimicrobial activity. Five extracts viz. Hexane, Chloroform, Ethanol, Ethyl acetate and aqueous were evaluated against 4 bacterial strains viz. E. coli (MTCC 40), S. aureus (MTCC 87), P. aeruginosa (MTCC 424), B. subtilis (MTCC 121). Results: The diagnostic characters were evaluated and documented. All the extracts showed good antimicrobial activity. Conclusion: Obtained standards will provide referential information for correct identification, purity, standardization and preparation of monograph. The work confirms that the studied plant has potent antimicrobial activity and has potential for antimicrobial drug. These results may constitute a basis for promising future applied research that could investigate the use of this plant as antimicrobial drug. Arora M, Kaur G, Kahlon PS, Mahajan A, Sembi JK. 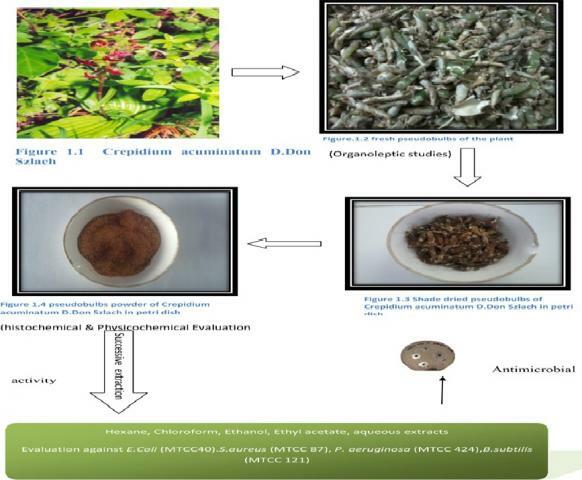 Pharmacognostic Evaluation & Antimicrobial Activity of Endangered Ethnomedicinal Plant Crepidium acuminatum (D. Don) Szlach. Pharmacognosy Journal. 2017;9(6s):s56-s63.